Interphase is the longest stage in the eukaryote cell cycle. During interphase, the cell acquires nutrients, creates and uses proteins and other molecules, and starts the process of cell division by replicating the DNA. Interphase is divided into three distinct stages, Gap 1, Synthesis, and Gap 2, which are discussed below. The purpose of interphase in all cell types is to prepare for cell division, which happens in a different stage of the cell cycle. Depending on which species of organism is dividing, the functions of the cell during interphase can vary widely. Some cell, like neurons, do not replicate their DNA during interphase, but enter resting phase or quiescence instead. This stage can be seen in the graphic below as the G0 stage. In this state the cell will exist without dividing until the cell dies. Other cells, like skin cells, divide a lot. Each time, they must pass through interphase (I) to accumulate resources to structure the new cells and replicate the DNA. The unique proteins produce by skin cells help them bond together after they die, creating a solid surface of skin cells that protects your body. After cells have finished dividing their chromosomes, and cytokinesis has divided the cell membrane, the two new cells enter the first stage of interphase, Gap 1 or G1. During this stage, the cell performs its normal functions, and grows in size. The cell replicates organelles as necessary. As seen in the graphic above, cells can sometimes leave G1 and enter G0, or resting phase, as described above. If the cell is an actively dividing cell, it will continue interphase by entering the next phase synthesis. During synthesis, the cell pauses its normal functioning. All resources are dedicated to replicating the DNA. This process starts with the two entwined stands of DNA being “unzipped” by various proteins. Other proteins, known as polymerase enzymes, start creating new strands to pair with each half of the DNA. This is done on each chromosome, which creates an identical copy of each, bound together as sister chromatids. If the cell is a somatic cell, it will enter mitosis after interphase and the sister chromatids will be separated, creating two identical copies of the genome in each cell. If the cell will give rise to a gamete it will enter meiosis after interphase. In meiosis, homologous chromosomes are separated in one division, then sister chromatid in the next, creating cells with only half of a full genome. These cells enter interphase, but synthesis stage cannot occur until fertilization occurs with another gamete. Either way, after synthesis, the cell must prepare for cell division. After the DNA has been replicated during synthesis stage, the cell enters a second gap stage, known as Gap 2 or G2. During G2 the cell the cell adds volume to the cytoplasm, and replicates many important organelles. In animals, the mitochondria are replicated to provide enough energy for the dividing cell. In plants, both the mitochondria and the chloroplasts must be replicated to provide the daughter cells with organelles capable of producing energy. 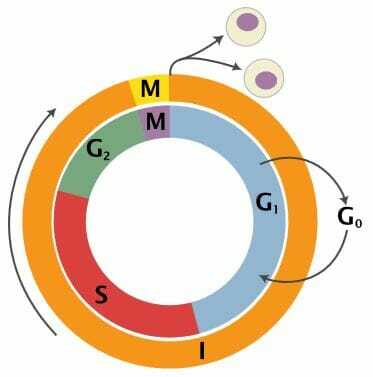 G2 extends until the cell enters cell division, seen as the “M” in the diagram above. The cell divides through mitosis, and the sequence starts again. If the cell divides through meiosis, the gamete must become fertilized with more DNA before fully entering into interphase and allowing the cycle to continue. Mitosis – A type of cell division in eukaryotes that creates identical daughter cells. Cytokinesis – The division of a cell membrane into two cells; the process that completes cell division. Resting Phase – A non-dividing stage of interphase that some cells can enter. Meiosis – Two consecutive cell divisions between which no DNA replication takes place. 1. A cell just finished dividing. It starts gathering nutrients and growing. It stops growing, and does not start DNA replication. What stage is the cell in? A is correct. This cell has entered the resting phase. Although the cell is not actually resting, it will not continue dividing until it receives signals from the body to do so. These signals could come from damage to nearby cell or from growth hormones telling the body to expand. Until then, the cell will remain in G0. 2. A cell has grown a little, and replicated its DNA. What comes next? B is correct. The cell has just replicated its DNA, which is the interphase stage of synthesis. The next stage is Gap 2, where the cell must prepare for cell division. Without the increased size and organelles produced in Gap 2, the cell would not have enough material to divide and would be much too small after division. 3. Why is there no interphase in bacteria? C is correct. While bacteria do undergo a similarly complicated cell cycle as eukaryotes, they do not have the internal organelles which show distinct phases of the cell cycle. The bacterial cell cycle is divided into 4 phases, A, B, C, and D, which roughly correspond to the various stages of the eukaryotic cell cycle. While A is the process of binary fission in bacteria, B, C, and D are similar to interphase in that the cell functions normally and duplicates its DNA.